Hello, my name is Aniceth Vincent and I am 30 years old. I was born in Tabor, in the Urambo District, which is located in the central-western part of Tanzania. I was born without any hearing problems; however, as I reached the age of seven I became deaf. The first couple of years I attended a primary school for deaf children, but had to stop after two years of going to a normal secondary school because I could not keep up, and there were no secondary schools for deaf people. Before coming to work at the Nuru Workshop I had to stay at home, having to rely on the help of my relatives. As time went on I started an apprenticeship as a carpenter. 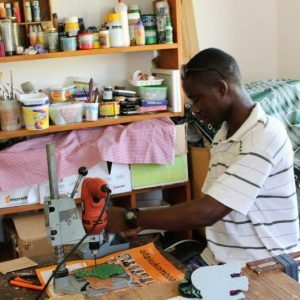 After finishing my apprenticeship, which went three years, I heard about the Nuru Workshop and the work that they do there. Starting 2014, I began working here and I have had the privilege of learning how to create a lot of new things. On top of this, the Nuru Workshop has allowed me to become more independent, and thus I do not have to rely on my relatives alone to cover my daily expenses. Hello my name is Julieth Paulo, and I was born in the Kinondoni district of Dar es Salaam. 24 years ago I was born being able to hear, but at the age of three month I became seriously ill and lost my hearing. Never having the chance to go to school or to let alone study, I had to depend on my parents and relatives. Until I came to the Nuru Workshop I could not communicate with anybody, due to the fact that I could not hear or know any sign language. I learned about the Nuru Workshop through the leaders at the time, however, I did not agree to work there in the beginning because I had never been anywhere except for at home. Nonetheless, after looking at the work and being encouraged by the people there, I agreed to give it a try. Over the years I have learned a lot of new things such a sign language, baking and sewing. I am a single mother of two children and through the work that I do I can now afford to rent a room next to the workshop where I live with my children. Moreover, both of my children can go to school and get an education, and I can cover our basic needs through the work I do. Esther was born fourth in the family in 1990 in Dar es Salaam. Unfortunately, her father died when she was 4 years old. Because he came from Mbeya, he was buried there. The suffering became even greater, because the family members of the widow’s (mother) father took all their belongings and put them out of their house because it was the property of her brother. The mother and the children had no other option than to move in with her in-laws. With the collection and sale of firewood they just kept their heads above water. During this time Esther suddenly became ill. Her mother took her to the hospital. She was immediately taken to the intensive care unit because she was in a coma. She had to be artificially nourished and ventilated. She woke slowly after eight months. But unfortunately she no longer had any feeling in her body from her belly down. The mother brought Esther to the church to pray for her. The miracle happened, the feeling came back, but her legs did not grow and remained powerless. The pastor of the church in Mbeya gave the mother a letter with which she could ask for help from a church in Dar es Salaam. The pastor of the church in Dar knew the Salvation Army and knew that she had a boarding school for handicapped children. So when Esther was 7 years old she could go to school for the first time. The pastor of the church was very generous and helped with school fees. Her mother often visited her in the boarding school. Esther received a lot of help there. She learned to live independently (washing, dressing, going to the toilet herself, etc.). Unfortunately, the pastor died, but God provided a number of Catholic sisters who helped with school fees. Esther was able to complete the primary school with a good result, so she could continue with high school in another boarding school. But because her mother had no money for a school uniform, Esther was shown the door every day by the teacher. But Ester wanted to learn and once the school was over she wrote the notes about her classmates who were allowed to enter the room. That went on for 3 months until one of the mothers took it up for Esther and started talking to the school management, then she was allowed to go to school. Her mother died shortly thereafter. Esther had now lost everything she had (her health and both her parents). This led to four difficult years in which she could see no future. Although someone donated food and school money, the children were further dependent on themselves. Esther dropped out because she gave up courage. Through contact with a mission organization, she gained access to a two-year training as a secretary. Slowly the joy returned to life. 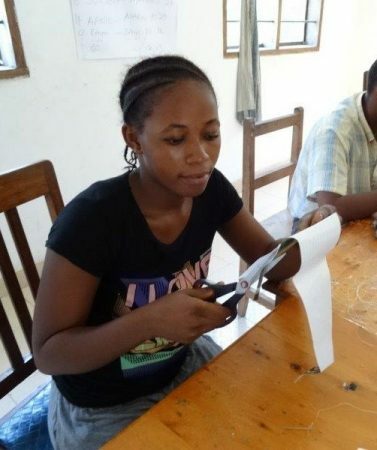 After obtaining her degree, she was able to start work in the Nuru workshop. Esther is now the key figure in the project. She has a lot of knowledge, speaks English and sign language. She is appreciated and respected by everyone.